Originally part of Virginia, Jefferson County was named for Thomas Jefferson, third president of the U.S. 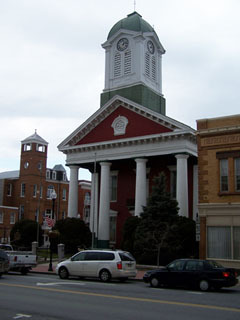 The county seat is Charles Town, named for George Washington's brother Charles. The county is bounded on the north by the Potomac River and on the east by the Potomac and Shenandoah rivers. Principal towns are Bolivar, Charles Town, Harpers Ferry, Ranson, and Shepherdstown. The northern part of the Shenandoah Valley was settled as early as the 1720s. Jefferson County is the oldest part of West Virginia. Several generals of the Revolutionary War had homes in the area, including General Horatio Gates (Kearneysville), General Charles Lee (Leetown) and General Adam Stephen, founder of Martinsburg in Berkeley County (also from Leetown). George Washington first saw the area when he was commissioned (at age 16) to survey the Fairfax family domain. Washington invested his surveyor's income in land on the Bullskin Run in Jefferson County. The Washington family eventually built five homes in the area between 1770 and 1825.